A tour where you can rejuvenate yourself amid best of scenic nature as well as explore the historical grandeur of bygone eras is something every traveller dream of. A tour Mysore and Wayanad is sure to offer a peek into royal eras of India as well as the scenic beauty of untouched nature. These two destinations when club together form a perfect holiday plan, owing to which we at Holidays DNA, have come up with a wide array of Mysore Wayanad tour packages. At our portal www.msyoretourism.travel a section of travel company Holidays DNA, our travel experts have dedicatedly brought some of the best tour packages for Mysore and Wayanad, catering to different kinds of holiday requirements. No matter what is your budget and holiday idea, you will find something suitable from our extensive list. Whether you are looking for a romantic getaway or a long family vacation to Wayanad and Mysore, or planning a trip with your friends; whether you want a budget travel or an ultra luxury trip, you will find suitable Mysore Wayanad tour packages from wherever you wish to travel from. Whether you wish to travel from Mysore to Wayanad or from other cities like Hyderabad, Bangalore, Chennai, etc., to Mysore, we make travel arrangements for all our customers. We also make customise tour packages for those with specific requirements. Along with this, what makes our tour packages special is the personalised assistance of our travel experts throughout your holiday, varying from booking of tickets, accommodation, cabs and guides to offering information about sightseeing places, restaurants, etc. Mysore, the cultural capital of Karnataka, is a place that every travel lover should visit. Its proximity to Bangalore city and well connectivity to the rest of the country makes it easily accessible too. Majestic palaces of Mysore still radiate the royal grandeur, while festivals like Mysore Dasara presents a living example of cultural and historical greatness of this city. Mysore Palace- Built in the year of 1912; it is the official residence of Mysore Royal family- the Wodeyars. Its architectural beauty which combines blends Hindu, Muslim, Rajput and Gothic styles of architecture is worth seeing. It is also considered to be one of the largest palaces in India. Chamundeshwari Temple- At a height of more than 3000 feet above sea level, this temple is on the Chamundi Hills. Devotees are required to climb about 1000 steps to reach this temple. Along with the religious significance, the view from the top of the hills makes it worth visiting. Jaganmohan Palace/ Jayachamarajendra Art Gallery– Jayachamarajendra Art Gallery was established in the Jaganmohan Palace which was built in the year of 1912 as an alternate residence for Mysore Royal family. It is especially known for its extensive collection of painting by almost all the celebrated painters from around the world. 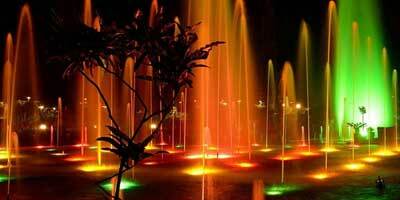 Brindavan Gardens- A trip to Mysore is not complete without visiting Brindavan Gardens. One of the best terrace gardens in the world and among first few in India, these gardens allure everyone with their entrancing beauty. Illuminated fountains and boating are major attractions here. St. Philomena’s Church- Dedicated to St. Philomena, this church was built during the rule of Mysore Maharaja Krishnaraja Wodeyar IV. It was built for the then European residents by the king, presenting a great example of religious harmony. Surrounded by Nilgiri Hills and hill stations like Coorg, Wayanad is beautifully located amid rich flora and fauna. Lush green plantations, majestic mountains, adventurous trekking trails, nature walks and adventure sports, serene lakes and waterfalls and mouth watering cuisine make your Wayanad tour unforgettable. Chembra Peak- The highest peak in Wayanad, Chembra Peak is nothing less than a dream place for nature lovers. It is especially popular among trekkers surrounded with lush tea plantations. There is also a lake here, Hridaya-sarasu, which is the shape of a heart and is said to never dry up. The view from here is unrivalled to any. Edakkal Caves- Another place to visit in Wayanad is the Edakkal Caves. These are a cluster of two natural caves which date back to 8000 years. These are located on Ambukuthi Mala, about 1,200 meters above sea level. The route to the caves is perfect for trekking. Meenmutty Waterfalls- Considered to the largest waterfall in Wayanad and the second largest waterfall in Kerala, Meenmutty waterfalls, flows from a height of 300 meters. This three tiered waterfall mesmerizes tourists with its enchanting beauty. Muthanga Wildlife Sanctuary- Close to the Karnataka border, located 16 km east of Sultan Bathery, Muthanga wildlife sanctuary is spread across an area of 345 sq km. Rich in flora and fauna, it is a must visit for nature lovers. Forest department also offer the facility of elephant rides. Kuruva Island- An ideal picnic spot, Kuruva Island is located on the tributaries of Kabini River. Spread over an area of 950 acres, this uninhabited island offers a refreshingly unique setting to spend some time with your loved ones amid rich flora and avian fauna. It is located 40 km north west of Sulthan Bathery. Mysore is well connected to the rest of the country via road and railways. The nearest airport to Mysore is in Bangalore city which is about 147 km away. The travel time from Bangalore to Mysore is not more than 3 hours. The distance between Mysore and Wayanad is about 131 km which can be covered in 2 hours and 50 minutes, while the distance between Bangalore and Wayanad is 285 km, which takes about 6 hours to reach. Wayanad is well connected to Mysore and Bangalore via road. There are many regular buses as well as private taxis running between these cities. If interested in travelling via train, the nearest railway station to Wayanad is in Kozhikode which is about 110 km away.